Stuff – Mitch Marsh, seen here celebrating a ton in the fifth Ashes test in January, says he’s worked on facing spin. 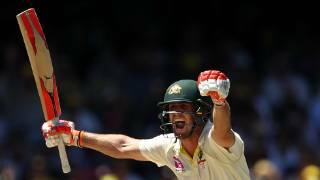 Fresh from his first century as an official leader, Mitch Marsh has declared Australia has embraced the need to live by a fresh culture – but hopes the public focus on this soon ends. Marsh has been elevated into the vice-captaincy for the test series against Pakistan, beginning in Dubai on Sunday. Marsh said left-hander Head, the South Australian captain, had proven he was ready to make his Test debut. But with Renshaw in doubt, it could mean South African-born Queenslander Marnus Labuschagne could also debut, giving the tourists four debutants for the first time since Australia took to the field without their World Series Cricket stars in 1977. “It’s never nice to see someone get hit in the head, but from what I’ve heard from the doctor he’s getting better and better,” Marsh said of Renshaw.